During the last console generation, there was a time when music and rhythm games dominated the landscape. Guitar Hero and Rock Band were some of the most successful games of their time, but just as quickly as they arrived, they disappeared. People started to realize that doing the same thing with different songs every few years wasn't exciting enough to return to, and the lack of evolution caused the genre to essentially die off. 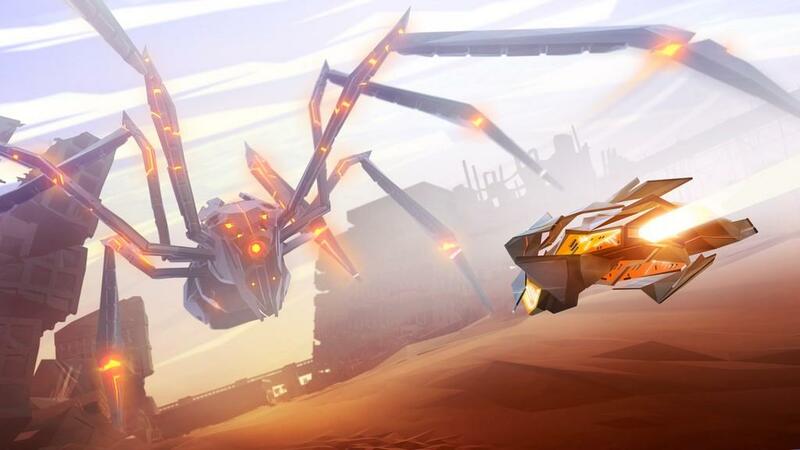 Aaero is the evolution that the games so desperately needed. 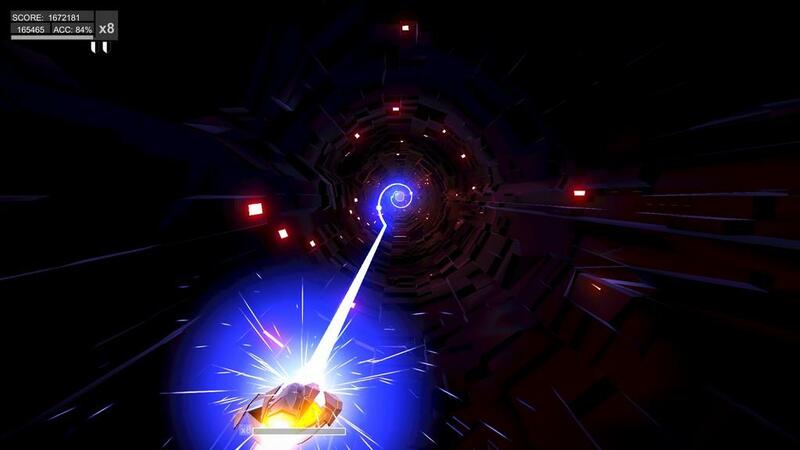 While it is fair to put Aaero into the rhythm game category, at the same time, it feels like it does too much to be limited to one genre. 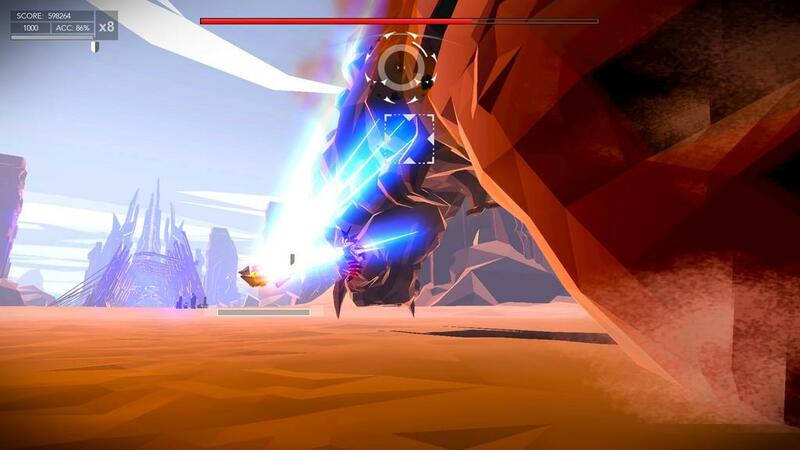 Aaero sees the players piloting a small aircraft through three different alien planets, fighting off enemy crafts, and dropping sick beats all at once. 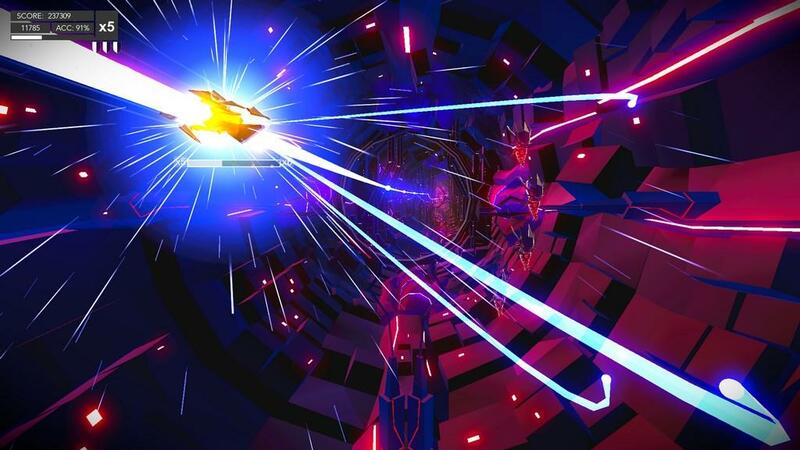 It plays like a mix between Star Fox and the vocals from Rock Band, as weird as that sounds. Your path is on-rails, and you can move it across a flat plane of a circle on the screen, using the left analog stick. 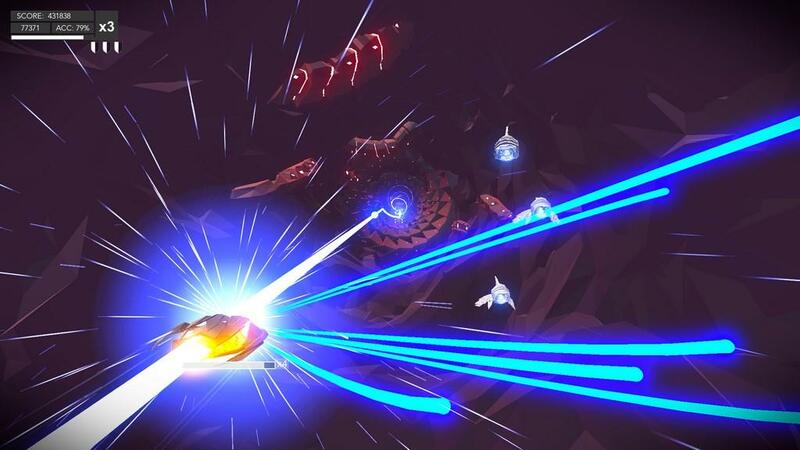 You move your ship in order to follow the neon blue ribbons, whose twists and turns mimic the bass track of the current song; this is the musical, Rock Band portion of the game. With your other hand, you'll use the right analog stick to shoot down enemy craft as they try to do the same to you. Moving the right stick brings up a cross hair, and with this cross hair, you'll lock onto the enemies and use the right trigger to shoot them down. 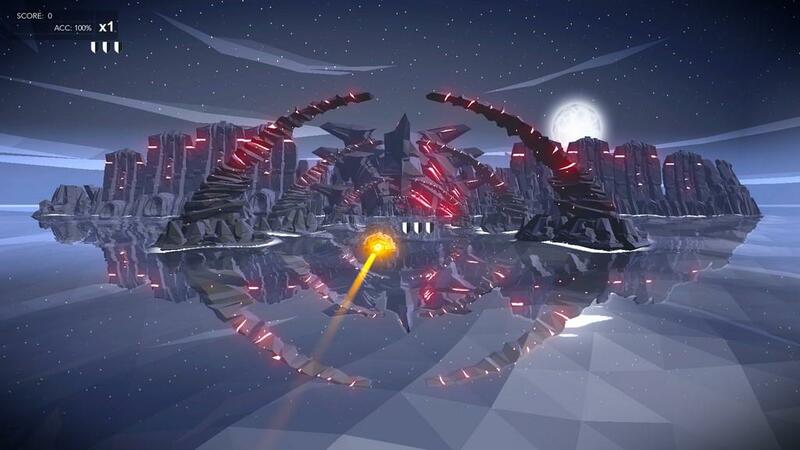 The enemies come in many different forms, and some of them will require several volleys of missiles to take down, meaning you'll have to follow the bass ribbon, aim, dodge, and fight all at the same time. This is the Star Fox portion of the game. The gameplay is, for the most part, really great. 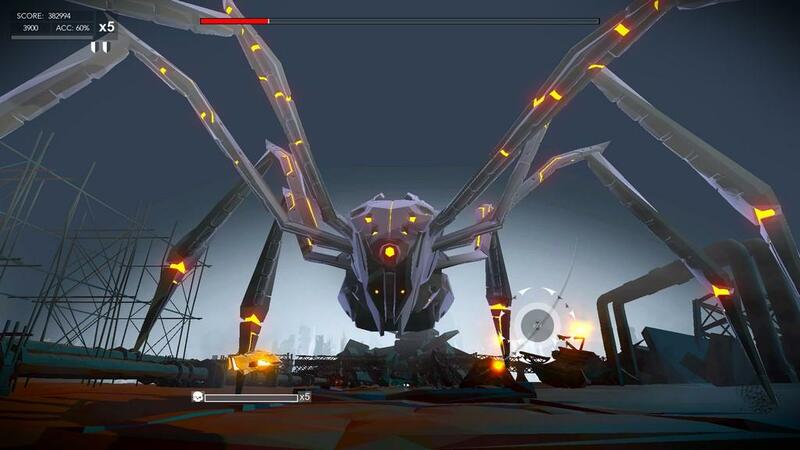 Following the bass ribbons is consistently fun throughout, but the combat has a tendency to get a little frustrating. 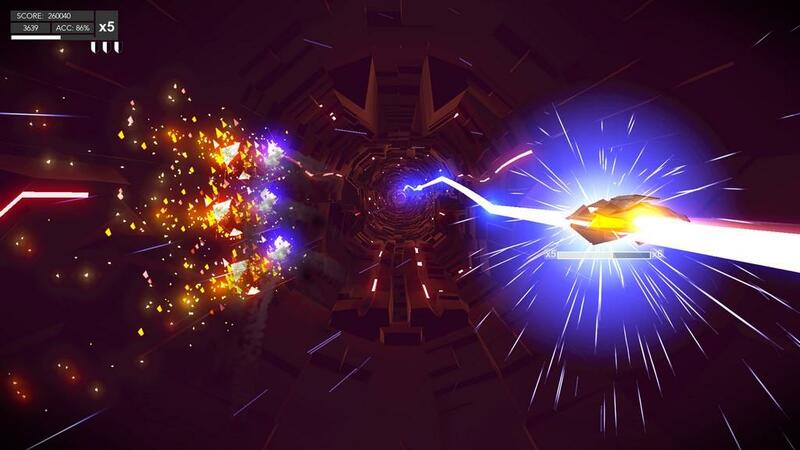 Your ship will explode each time it takes damage, and you'll only have three lives per level. Usually, it's more than enough, but sometimes some little issues with the combat can really get in the way of the game's flow, and you'll find yourself restarting the same level several times. The frustration here comes from the fact that your deaths are usually a result of one of two things. The first is that sometimes your missiles don't launch as fast as they should. Enemy projectiles move slowly, and the only way to avoid getting killed by them is to shoot them down before they reach you. Unfortunately, your missiles sometimes fire in a flared pattern, presumably just to make them look cool (which it does), but that often results in the missiles not going directly to the projectiles, and not intercepting them in time. This sounds like a minor issue, but it happens a lot, and is the biggest negative of the entire experience. Imagine a fighting game where, instead of blocking, your character decides to do a pirouette; that's how integral this part of the game is. The other problem is that sometimes the enemy projectiles will blend in to the background because they are the same color. This one doesn't happen as much, and almost never enough to force you to restart, but it can still be an unpleasant surprise that feels a little bit unfair. 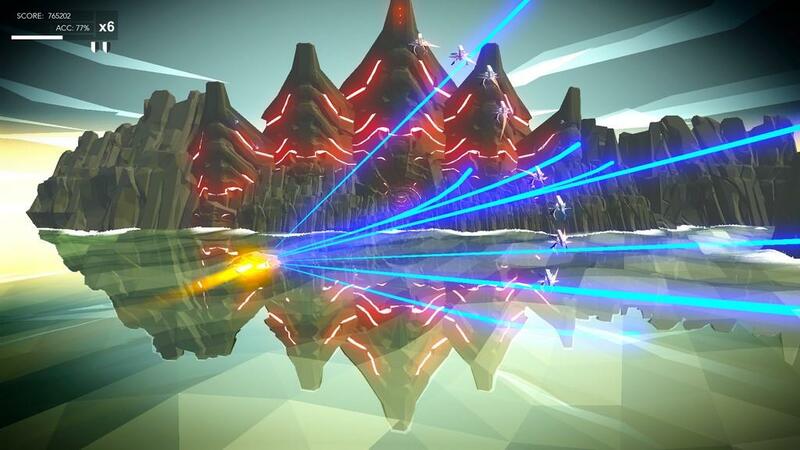 And speaking of the backdrops, Aaero is absolutely gorgeous. 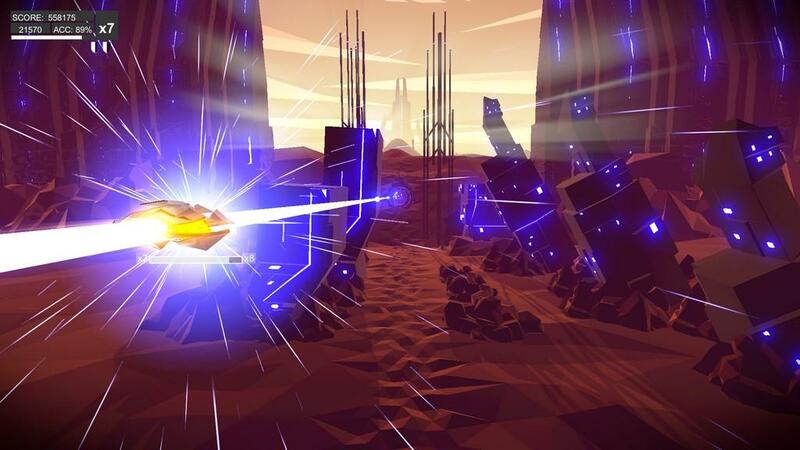 The art style is very geometric and sci-fi and so full of beautiful vistas, neon colors, and enormous, monolithic objects that I was constantly in awe while playing. I'm not exaggerating when I say that my jaw dropped multiple times during the first act of the game, which is set in a vast desert, filled with huge mountains, staggering horizons, and an absolutely stunning boss fight that I won't spoil for you here. The levels, and the movements within them, are absolutely perfectly synced with the music, as well. While the music is, of course, an integral part of the game, the songs do feel more like soundtracks for the gorgeous visuals. I don't mean that to be a reductive statement about the music, either, but a compliment for how well it complements the visuals. I really can't overstate what an amazing sensory experience this game is. It's like being taken on one of those stationary 3D roller coasters at the mall, except rather than a waste of money, it's the best music video ever made. 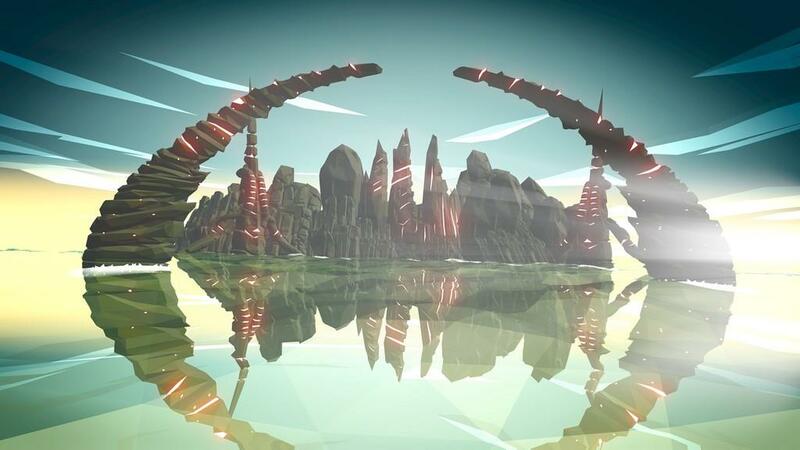 I'm a big music guy, but I'm not a big electronic music guy, so I only recognized one of the nine artists on the soundtrack in Aaero, but from what I've gathered, this is actually a really solid list for fans of the genre. I can't speak to that myself, but it is supported by what I've read online. What I can speak to is that, regardless of your musical tastes, you're going to like what's on offer here. Even if electronic music isn't your thing, it so perfectly suits the gameplay here that you will appreciate it as one part of a larger whole. The only other thing there is to say is that the game is quite short. There are only fifteen songs/levels, and I played through normal mode in a single sitting. There are two unlockable difficulties, Advanced and Master, but the requirements for unlocking them are really intense. For Master, you need to perfect every single level on both previous difficulties. In addition, Advanced and Master themselves are both really difficult, and I wouldn't be surprised if some people didn't want to play those difficulties regardless. This isn't a criticism, necessarily, just something that I think you should be aware of going into the game. 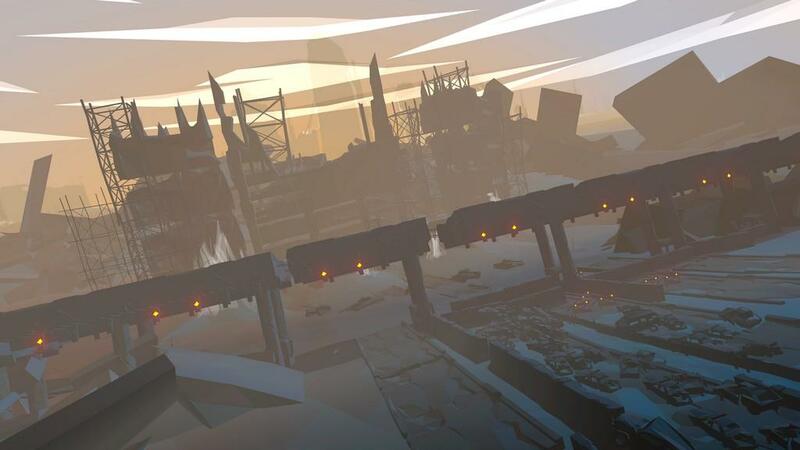 Besides that, Aaero is a stunningly beautiful and surprisingly exciting game. I do think there's something here for everyone, and if you are even the slightest bit interested, you should check it out for yourself. 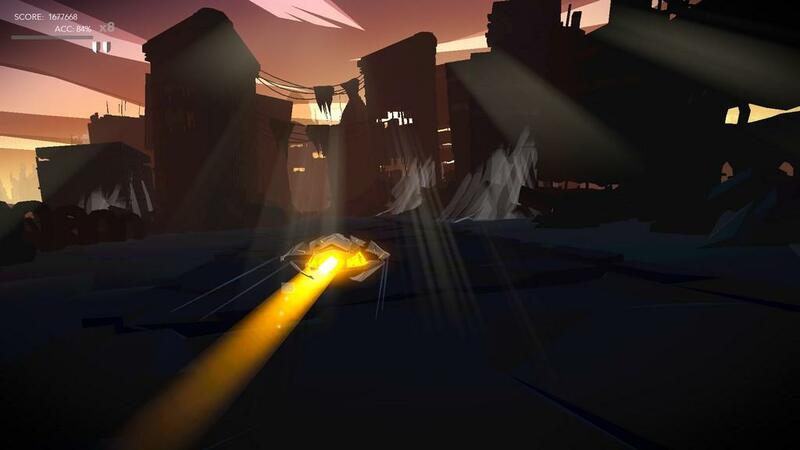 Do your best to go in blind, though; Aaero is at its best when it manages to catch you off guard with its incredible sensory experience. 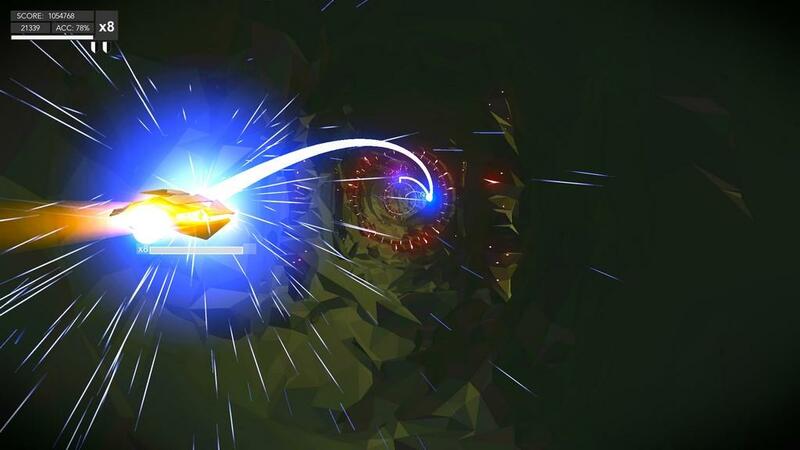 One of the most visually and auditorily exciting games I have ever played, Aaero provides such an exciting sensory experience that I would recommend it to everyone, despite occasional frustrations and hiccups along the way.